Electron microscopy allows for higher magnifications of a sample by using a beam of electrons to create an image, meaning much smaller objects can be examined in finer detail to reveal their microstructures. A typical scanning electron microscope (SEM) uses a single beam to gather data from a material, using electrons to image and x-rays to analyse the sample. The focused ion beam-scanning electron microscope (FIB-SEM) adds a second beam, the ion-beam, to cut into the material while the SEM carries out high-resolution imaging. This method can build a 3D stack of data representing your sample layer-by-layer at the nano-metre scale. For comparison: A human hair is typically around 80 microns (or 80,000 nano metres) wide. 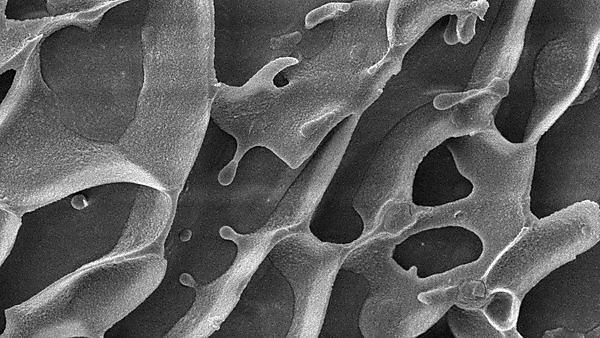 Using our FIB-SEM, you can view your products at less than a 10,000th of a human hair. This detailed analysis offers a greater understanding of how materials interact with each other. Both FIB and SEM can be used independently, but combining them into a single system opens up a wider range of options that are otherwise not possible. 3D cross-sectional chemical analysis (EDS/EDX). 3D cross-sectional electron backscatter diffraction (EBSD). Lamella (thin section) preparation for TEM and TkD. Low voltage STEM (Scanning transmission electron microscopy). What could FIB-SEM do for your company? Focused ion beam–scanning electron microscopy (FIB-SEM) can be a solution for a broad range of industrial applications. The main areas typically covered include failure analysis, product quality verification, and new product development. Visit our Ramer Ltd and South West Metal Finishing Ltd case study pages to see the details.